The Beijing international community is working with gusto on sustainable living, in the city and the world. Events like Live with Less promote minimalism and sharing goods. The Bulk House supports the zero waste movement and sells the tools to help you turn your home in a more sustainable place. Clothing Auctions’ focus on reusing instead of buying new has helped the movement take off within the female expat community of Beijing. It’s great to see how people come together and get informed about ways to save our planet. 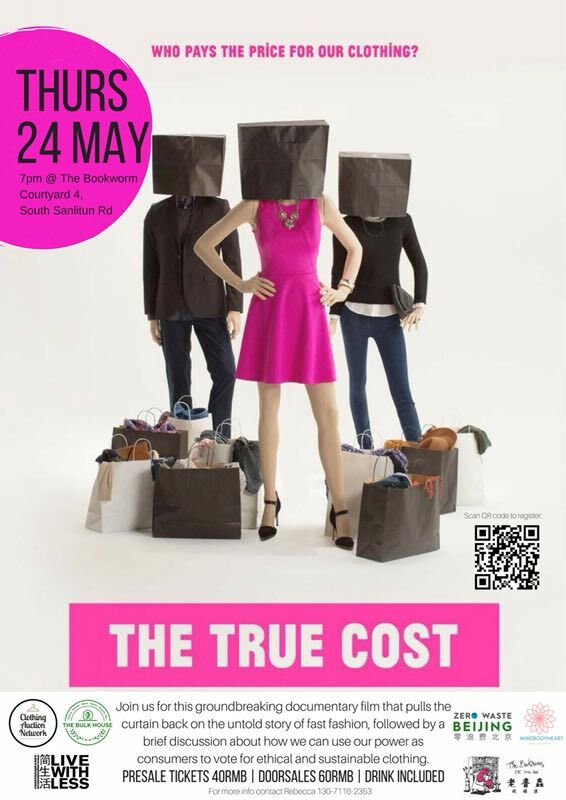 Next weekend, the screening of the movie The True Cost at the Bookworm will educate viewers about the impact of fast fashion on the people who work in clothing factories, and the environmental cost we all pay. This movie will show with all honesty how fast fashion is bad for the earth, and has been an eye-opener for many people. There will be a discussion panel afterwards with Rebecca Archer (Clothing Auctions), Luna Ward (who blogs about sustainable fashion), Natalie Bennett (Live with Less), Joe Harvey (Bulk House), and Hans Galliker. Join this evening to see the groundbreaking documentary film that pulls the curtain back on the untold story of fast fashion. Click here for more information.